A little over a year ago, I posted an article entitled The Essential Bookshelf: The Only Eight Books I’ve Kept (After Hundreds of Reviews). 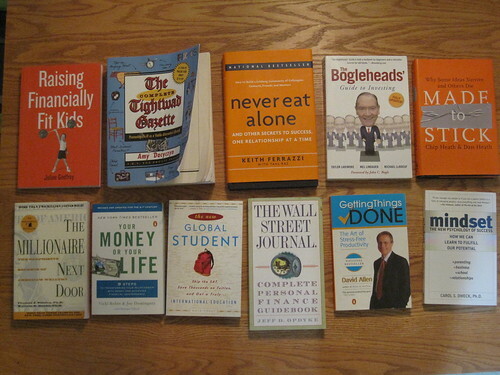 In it, I discussed the fact that I’d read and reviewed hundreds of personal finance, personal growth, productivity, and career books for The Simple Dollar, but had only found eight of them essential enough for me to keep for future reading and reference. Since then, more than a year has passed. I’ve read somewhere around eighty more books on those topics and integrated tons of advice into my life. I’ve also found that I’ve “drifted away” from some of the books in my library, finding other ones that provided food for thought. So what does my library look like now? Here are the eleven books I’ve reviewed on The Simple Dollar that I own a copy of and turn to regularly for inspiration and reference. Yes, out of the nearly three hundred books I’ve reviewed (here’s the complete list – my book review index), I’ve only read eleven that have found a permanent place on my bookshelf. Here they are – the links go to detailed reviews and discussion of the books. Getting Things Done is, hands down, the best book on time management I’ve ever read. The basic idea behind it – the piece that really stuck with me and changed how I managed my time and my information – was the idea that by writing down everything in your head instead of trying to remember it – and then reviewing what you wrote down very regularly – you can free up your mind to focus more intently on the task at hand. From this basic idea, David Allen builds a thorough time management system – though it’s very modular, meaning you can just pull out the pieces that work well for you. Whenever I feel I have too much on my plate, I usually step back for a bit and take a serious look at Getting Things Done through a pair of fresh eyes – and it often provides just the answer (or the inspiration) I need to reorganize the way I’m doing things and find the time to take care of the things I need to take care of. Your Money or Your Life singlehandedly inspired me to take control of my finances. More than any other book, this one convinced me to stop and really think about what I was doing with my money. It pushed me to reconsider my goals and choices in life and pushed me towards the realization that most of the material stuff that filled my life was largely unimportant. I turn to Your Money or Your Life whenever I struggle with temptation. If I find myself feeling aimless and giving into short term desires too often, my long term goals begin to slip away, and Your Money or Your Life is a brilliant antidote for that very problem. The Complete Tightwad Gazette is kind of a “nuts and bolts” guide to trimming your spending. It’s incredibly long and detailed, filled with countless specific ideas for trimming your spending. The book is actually organized much like a blog, as it consists of hundreds of articles extracted from the 1990s Tightwad Gazette print newsletter. I often pick up this book, turn it to a random page, and look for new cost-cutting ideas to try out. Sometimes, the suggestion is a very simple one, saving me just a few cents – at other times, it makes a huge difference. Every time, though, I’m entertained by the experience I have with this book and, over the several years I’ve owned it, the book has saved me quite a lot of money. Never Eat Alone, which I’m currently reviewing in detail, is a powerful discussion of the art of building friendships and value-based “weak ties” with other people. A network of friends in your life is incredibly valuable – it provides companionship, advice, and often material assistance in countless different ways. My nature leaves me a bit ill at ease in social situations, so I’ll often turn to this book for insight, particularly when I’m facing an upcoming social situation where I want to build relationships with the people I’m meeting. Without fail, Never Eat Alone provides the advice I need to help me turn those events into a success. Made to Stick focuses on how to present ideas in a way that makes them tangible to the people that receive them. Since I’m effectively in the business of sharing my ideas with others, the advice in this book is particularly relevant to me – but it’s invaluable to anyone who works in an information-heavy environment. For me, this book provides constant help when I’m writing articles. I often know what I want to say, but at times I’ll struggle with a catchy way to present that idea so that it sticks in people’s minds. When that happens, I’m glad that Made to Stick is right at hand. It’s an invaluable tool for anyone who has to present ideas as part of their work. The Wall Street Journal Complete Personal Finance Guidebook is my default money reference book – whenever I have a question about how a particular investment works or a general game plan for handling a particular financial situation, this is where I start. It’s definitely a reference book for me and, while there are books out there with more detail, I find that this one strikes the best balance of accessible writing and timeless material – instead of going into abundant detail (which would make the book dated quickly), the book often sticks with more general concepts, allowing me to use this book as a default starting point. The Wall Street Journal Complete Personal Finance Guidebook is almost always the book I turn to when a reader writes to me with a fundamental personal finance question (like “how does a checking account work?”). Thus, it’s also my starting point for research when I begin to write a “personal finance 101” article which explain basic money concepts. Whenever I need those answers for my own life, I start here. Raising Financially Fit Kids was the most recent addition to this shelf, but it’s simply the most thorough and thought-provoking book I’ve yet read on how to teach money concepts to one’s children. The book is laid out and organized exquisitely well, making it quite easy to pick up and dig into whatever area of my child’s financial education that I want to focus on in a given moment, and the thorough nature of the book means that I rarely have a question that isn’t addressed in a thought-provoking way. I have two kids at home and the oldest of the two is just beginning to become really aware of the role that money plays in his life. As he grows into new layers of responsibility – and his younger sister begins her journey as well – I feel pretty good being able to use Raising Financially Fit Kids as a guide to help me parent them through this process. The Millionaire Next Door forces me to question my assumptions as I slowly move from a desperate financial situation to a more stable one. I picked it up again recently (via PaperBackSwap) after reading and enjoying the more recent books Rich Like Them and The Difference, which focus on similar topics. The Millionaire Next Door works because it focuses on the specific things that financially successful people do to make themselves financially successful. By seeking out people who truly had achieved financial success, the authors found that many of the traits that these people had in common are far from what are typically seen as “rich” traits. Many financially successful people are quite frugal, in fact, and derive pleasure from non-material sources. Every time I dig into this book, I find a new insight that makes me reflect on the choices I make and whether or not they’re really in line with some of the bigger ideas I have for my life. The Bogleheads’ Guide to Investing is simply my default book for all investment advice. When I have a question about specific investment options, which investment options to choose, and when I should choose them, this is the book I immediately turn to. The Bogleheads’ Guide to Investing does a brilliant job of explaining the nuances of specific investments from a conservative perspective – excessive risk is bad, which is a philosophy I agree with (unless you recognize that you’re just gambling with the money). It’s a fairly dry book – it definitely functions better as a reference – but if you want strong advice from a conservative investing perspective, this is an extremely well-executed reference resource. Mindset has caused me to question my thinking and perspectives over and over again over the past six months. Am I boxing myself in by thinking too small? What can I do to make choices that give me room to grow, both personally and professionally? Am I thinking of all of this in the right way – a way that leaves me open to the abundant possibilities of the future – or am I assuming that things will just stay the same? And am I teaching my kids appropriate lessons that will allow them to grab the world by the horns? The big idea behind Mindset is that there are two distinct ways of looking at the world – a “fixed” mindset, in which you believe that you and the world will stay largely the same, and a “growth” mindset, in which you believe that you can change and grow as a person. People who subscribe to the “growth” mindset have a much stronger likelihood of achieving things because they’re willing to invest significant time and effort to improve themselves – because they believe it’s possible. Mindset digs deeply into this idea, and I find Dr. Dweck’s insights deeply engaging and worth returning to regularly. The New Global Student is all about education, and it takes the fairly controversial stance that the typical SAT/ACT/extracurriculars/AP classes/college path that many students follow does not prepare students to succeed in the real world. Instead, you should encourage your child to initiate truly independent projects and encourage them to explore diverse situations, even going so far as to live in other countries. Why? Such experiences teach children to be highly self-reliant and resourceful, making the experience of college much easier (if they choose it), and given a set of such challenging activities on a college application, admission is often easier than you think. As my children begin to approach school age, I’m constantly thinking about how I can teach them to be more self-reliant. Right now, independent play works, but what about when they’re in school? When they’re teenagers? I believe firmly that self-reliance and resourcefulness are the most valuable lessons one can teach their children – and a pretty sure route to your children’s future personal and financial success. The New Global Student is a challenging handbook for those ideas. What about the other books? Many of the books I review are checked out from the library. The ones which I receive a review copy of often have those review copies sent on to readers who express a certain interest in the book. If this fails, I swap the copies I don’t want to keep via PaperBackSwap or find others in the community who may want them. A great library isn’t full of books you’ve already read and know – it’s full of books you haven’t mastered and haven’t yet read. These are the ones that continually challenge me and push me to grow.